We are so close to our goal on Kickstarter. With only 19 hours to go, we need to raise a final £97. If you think you might be able to help us. Give the page a look and please donate. Although we’ve received much publicity so far, we still have 9 days to go and have not quite reached our target of £600. George and I would both be so grateful if you could share or like our Kickstarter campaign, or even donate (if you can) in order for our project to be a success. We are already rehearsing scenes and writing the soundtrack to the piece, including writing funding applications for some more UK performances this Autumn. So here’s the link and hopefully, next time we post, we’ll be even closer to our goal! 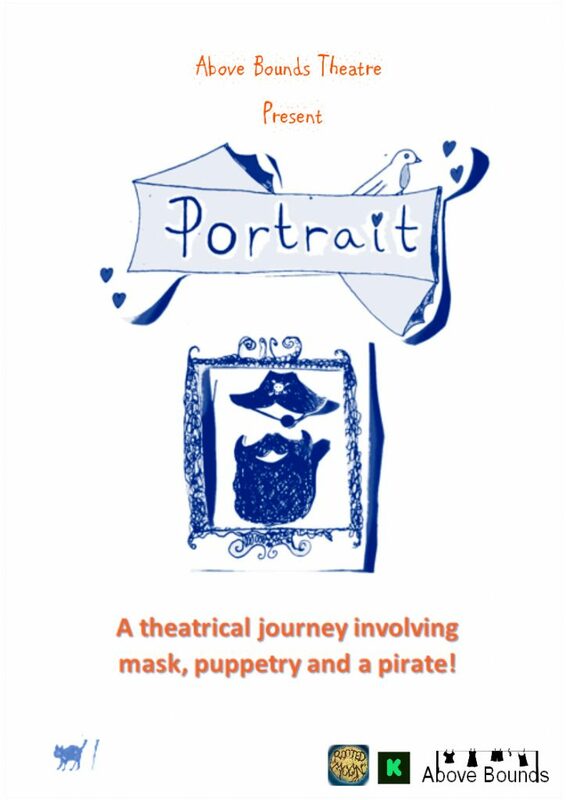 We’ve been busy designing the poster for our latest piece, Portrait, which we are hoping to take to the Rooted Moon festival in Sardinia this August. The main elements of the poster were drawn by hand before being scanned into a computer. We really wanted the poster to show the child-like nature of the piece and for the design to have a ‘home-made’ feel to it. Because we will be touring the show abroad, we will be working with minimal props. We hope that the majority of the props will be made by us. Thank you so much to everyone who has shared or donated to our Kickstarter. We are getting ever closer to our target now, so please do keep spreading the word. We have some exciting news! This year, Helen and I will be developing a family show which we are hoping to take to the Rooted Moon International Theatre Festival this summer. We are currently putting together some ideas for the show and will be running a Kickstarter campaign to fund the development of the piece. Keep an eye out over the next few weeks for updates and how you can support our journey. We have been busy developing our show Listless which we hope to develop and rehearse in the future. Listless takes place in a rundown café and shows a group of people brought together to discuss death, They don’t know why they have been brought together or who arranged the meeting, but they are there and they have a job to do. Terminally ill, rapt with guilt, looking for an answer, they all have an immediate relationship with death and they want to talk about it. Through their musings on suicide, dying, grief, forgiveness, the afterlife and funerals, we see not only the end but the beginning of life. Subscribe and look out on social media for details of productions and how YOU can get involved. As you may have seen from our twitter feed today (@AboveBounds) we have been thinking about Shakespeare’s Hamlet. Now one of the set-backs of Twitter of course is the 140 character limit. Shakespeare had no such limitations, so here we would like to share with you a slightly longer quote and hopefully spark a thought. It’s a well known speech but that doesn’t relinquish any of its potency. Enjoy! me than a foul and pestilent congregation of vapours. What a piece of work is a man! how noble in reason! express and admirable! in action how like an angel! what is this quintessence of dust? This site is our newest home, so please follow us for updates on our shows, rehearsals and how to get involved. On here you’ll find our musings on theatre, style and design as well as our support for other companies and Art Forms. Follow us here to follow our journey!